Imagine you could use a standard 3D printer to create your next robotic assistant. Just snap in a motor and battery, and it's ready to go. That's precisely the scenario made possible by a new 3D printing technique developed at MIT. Liquids have long been a challenge for 3D printing, and they're necessary for hydraulic devices like moving robots. On Wednesday, researchers at MIT’s Computer Science and Artificial Intelligence Laboratory (CSAIL) announced what they call the first-ever technique for 3D printing robots that can print solid and liquid materials at the same time. That means it's possible to print dynamic robots in a single step, using a commercially available 3D printer. The paper will be presented next month at the 2016 IEEE International Conference on Robotics and Automation (ICRA) in Sweden. Most approaches to printing liquids have required additional post-printing steps such as manual cleaning, making the liquid step tricky to include in factory-scale manufacturing. With the new technique, an inkjet printer deposits individual droplets of material that are each 20 to 30 microns in diameter -- less than half the width of a human hair. The printer deposits different materials layer by layer and then uses high-intensity UV light to solidify the non-liquid portions. 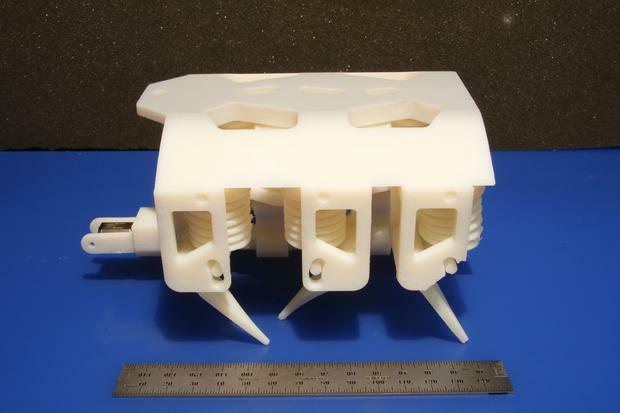 To demonstrate the concept, the researchers printed a six-legged robot that can crawl using 12 hydraulic pumps embedded within its body. It weighs about 1.5 pounds (680 grams) and is less than 6 inches (15 centimeters) long. A single DC motor spins a crankshaft that pumps fluid to the robot’s legs. Aside from its motor and power supply, every component is printed in a single step, with no assembly required. With modifications, even existing multi-material 3D printers could use this technique, the researchers say. The technique allows for a customizable design template to create robots of different sizes, shapes and functions. Potential applications could include disaster relief in dangerous environments.